I've put in a replacement windshield, removed the rust in the doors, and had it repainted, otherwise it's almost all original! The chrome was amazing! I was lucky! I'm needing to replace the padded dash, side mirrors, head liner. I also need to get the radio, temp gauge, fuel gage, and clock and wipers to working again. Need to upgrade some more of the metal mouldings and trims on the doors and console, they're pretty worn. Got some of those replaced by Nick's T-Bird's. Highly recommend them! Nice lookin car and welcome. Yep the mirrows have to go. Nice color combination. They reproduce the correct mirrors for 1960. Pretty car... almost looks like the Sunroof Car you have at the top of the page Alexander. That is a GREAT looking Bird!!! Must be the two-tone combo, it just SCREAMS "classic". The optional hub cap center medallions look great on that color too!!! Thanks guys! I have had a couple old cars, a Chevy, a Chrysler, Plymouth, etc. But this one car has become an obsession! 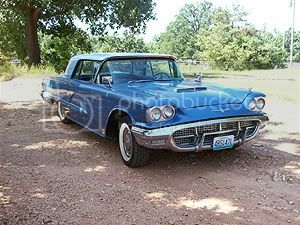 I almost bought a 1962 Thunderbird locally, but then I happened across the 1960 body style and fell in love with it. Looked for about 5 months, finally found this one about 2 hours away. Bought it immediately, and every spare dime has gone to getting it as I want it. I've got about 10 catalogs here, and have been surfing ebay and asking around. My dash is perfect except for a tear on the far right passenger's side ... and some slight sagging from age. It's blue, and of course the repros only come in black and white, so I will have to dye the vinyl. Personally, I hate this because the dye job, no matter how good, never lasts as long as it should. I also need to replace the hinge covers, but they are only available in black and red, so they'd have to be dyed/painted as well. Does anyone recommend any dyes or paints for these? Any suggestions on making them permanent? I've seen some of the nicest restorations with flaking and scratches and rubs. I have an new old blue dashpad. It is not a reproduction. Contact me by private message if interested. Okay, it's been about a year and a 3 months since I posted photos. I've been busy with work and school, and money has been tight, so I haven't been able to do much with the car. So, I took it to a paint guy here that's done all the paint jobs on the cars that seem to win most often at local car shows. And, he happened to repaint my Mustang for me a couple years back so I know his work well. I saved my money for a year, and I've taken the car to him and he's taking off the last paint job and going to give me a quality one. I've surprised myself though cause I'm not going with the original paint! Can't believe I'm gonna do it, but I'm having him do a slight custom paint job with the fenders and doors painted to match the top. What tires are you running in this photo -- They are radials I think. What's the brand and size? Last edited by bcomo; November 21st, 2008, 09:41 PM. I'm not really sure what they are, I don't have them any more. They were too wide and they rubbed when I would steer the cara sharp left or right. I had them on for about a month, took them off and replaced them with some Viper tires that I already had, which also rubbed when I would steer the car. They are too wide, but I'm leaving them on until I get it back from the paint shop so I can put on the Coker Classic tires I've ordered. I got the G78 x 14", 2 1/4" whitewall. They were about 98.00 each I think. I coulda gone with the tires that were a little more expensive, but I'm having to watch my money, doing this on a student's budget. HA! Guess I should focus on more important things, but ... hard to do! Personally, I love the two tone paint job! I do not know why Ford did not think of that back then. I think it really sets the car off with the top matching the front side section. I think it enhances the beauty of the car. What a difference between when your first got it and now! One would not realize it is the same car. You have done wonders with it under your circumstances. Awesome! And I love that the dark blue goes under the door and up in the front. You have done a very impressive job on this one! Brandon the evolution of your 60 is quite remarkable and the colour combination you have picked is great. I too agree with the guys that the tutone application really sets off the lines of the bird. Great job and welcome back.